The musculo-skeletal system allows us to move in space. Different muscle groups will have different primary functions, such as generating power for gross movements (e.g. most lower limb muscles), or modification of the movement of other muscles to generate delicate movements (e.g. intrinsic hand muscles). The actions of these muscle groups, or even individual muscles, can be describes accurately using specific anatomical terminology. The starting positing for all movements is the anatomical position. Most movements will come in pairs, with one movement being the reverse of the other (agonist and antagonist). Flexion and extension are movements which occur relative to the coronal plane. Flexion decreases the angle between two joints, whilst extension increases this angle. In general, flexion positions the limb in a more anterior position, whilst extension more a more posterior position (the notable exception to this is the knee joint). Abduction and adduction are movements which occur relative to the medial sagittal plane. Abduction increases the angle from the midline (e.g. moves structures away from the body), whilst adduction decreases this angle (brings structures closer to the body). Medial and lateral rotation occur relative to the long axis of a bone. Lateral rotation mean that the anterior surface of the bone faces laterally, whilst medial rotation causes the anterior surface to point medially.  There are some areas of the body where special terminology or reference points are required, mostly in the limbs. In the hand abduction and adduction of the fingers occurs relative to the middle finger, rather than the midline. This means that the middle finger can be abducted in both the ulnar and radial direction! Another area of confusion can be description flexion/extension and abduction/adduction of the fingers and thumb. The thumb is at 90 degrees to the fingers, and so all of its movements are perpendicular to those of the fingers. One helpful way to remember this is that movements of the digits are relative to the nails. Flexion occurs on the side of the pulp of the finger, extension occurs on the side of the nail. Abduction of the thumb is movement away from the palm, adduction is towards the palm. Finally, bringing the thumb into contact with the pulp of the digits is known as opposition. This is seen in making an 'OK' sign with the hand. 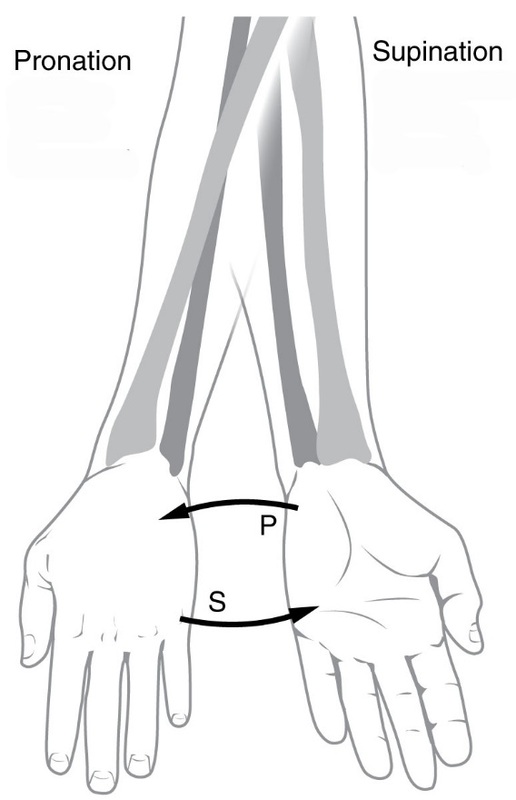 In the forearm the radius is able to cross over the ulna causing the palm to face posteriorly. This rotational movement is called pronation. Bringing the palm back to the anatomical position is known as supination; the forearm is supinated in the anatomical position. The scapula can be rotated superiorly or inferiorly, but can also 'slide' forward or backwards relative to the thorax. These movement are known as protraction (anterior) and retraction (posterior). Sometime flexion and extension of the ankle joint is described as plantarflexion and dorsiflexion. Plantarflexion increase the angle between the dorsum of the foot and the tibia (points the foot towards the floor) and dorsiflexion decreases this angle (points the foot towards the ceiling). Movements can occur at the subtalar joint changing the direction that the sole of the foot faces. Movement to make the sole of the foot face medially is known as inversion, moving the sole of the foot to face laterally is known as eversion. Fortunately all the toes move in the same direction, however, as with the fingers abduction and adduction doesn't occur with respect to the midline, but rather one of the central digits. In the case of the foot, abduction occurs relative the the 2nd metatarsal. The major movements to remember are flexion, extension, abduction, adduction, medial and lateral rotation. There are many cases of unusual or special cases, which are discussed above. It is important to understand planes of movement, especially when examining the musculoskeletal system. Understanding planes of movement allows clinicians to succintly describe examination findings to one another. Movements are also important in understanding mechanisms of injury. For example, ankle fractures may be caused by forcing the foot into excessive inversion/eversion, and these produce different injury patterns. It is important to be able understand and accuretely decribe movements to facilitate communication between clinicians.